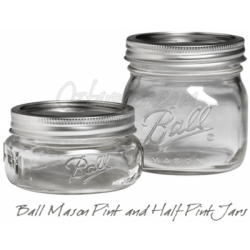 Ball jars are proudly made in the USA. The lids are free of BPA. We recommend using only Ball® or Kerr® brand lids. BPA-free, these brands offer the safest, most reliable results of any lid on the market. Foods sealed with SureTight lids can be safely stored for up to 18 months. 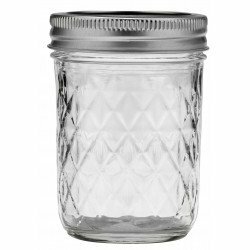 Use a fresh lid every time to ensure your jars seal properly, safely preserving your food. After the first use, the lid will no longer seal effectively. Preheating lids is not required. After extensive testing by our Quality Assurance Team, we found that it is no longer necessary to pre-warm lids before use. While it is still safe to simmer your lids before use, you should never boil them. 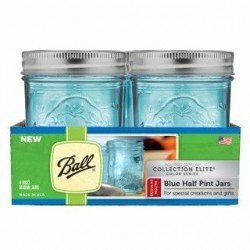 Ball Regular Mouth 8oz Quilted Glass Preserving Jar Single Capacity: 8oz = 240ml Size: 100mm high Mouth size: 70mm Regular Mouth Case size: single jarSuggested uses: chutneys, jams, pickles, jams, preserves, tealight candle holders, glass storage Suitable treatment methods: dry storage, vacuum seal, fermenting, water bath, pressure can and freezeNote that the quilted pattern covers most of the jar but there is a small round oval to allow a label to be placed on the jar.Each jar comes complete with 2 part lid consisting of a flat disk incorporating a seal (the lid) an..
Capacity: 12oz = 340ml Size: 135mm high Mouth size: 70mm Regular Mouth Case size: 12Suggested uses: chutneys, jams, pickles, small drinking glass, floral displays, candle makingSuitable treatment methods: dry storage, vacuum seal, fermenting, water bath, pressure can, freezeEach jar comes complete with 2 part lid consisting of a flat disk incorporating a seal (the lid) and a twist on ring to hold the lid in place for processing (the band).Lids are recommended for single use only if the jar is heat processed using a water bath or pressure canner.Bands can ..
Ball Regular Mouth Quilted 4oz (120ml) Quilted Crystal Jars are ideal for fresh preserving recipes such as jams, jellies, sauces, mustards and flavoured vinegars. 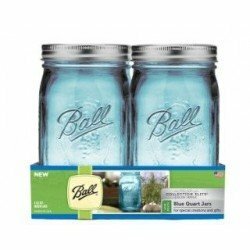 The Quilted Crystal design adds a decorative touch to these multi-purpose jars also use them for serving creative decor and gift giving.The jars come complete with a single use flat lid that has its own inbuilt seal and a reusable screw on band to hold the lid in place during the preserving process.Hand wash lids only. Do not put in dishwasher. Dry thoroughly immediately after use to avoid corrosion..
Capacity: 8oz = 240ml Size: 100mm high, 70mm wide Mouth size: 70mm Regular Mouth Case size: 12 Suggested uses: preserving fruits, chutneys, pickles and jams; candle making; floral arrangements; small drinking glassesSuitable treatment methods: dry storage, vacuum seal, fermenting, water bath, pressure can, freezeNote: Ball jars are not recommended for baking or microwavingEach jar comes complete with 2 part lid consisting of a flat disk incorporating a seal (the lid) and a twist on ring to hold the lid in place for processing (the band).Lids are recommended for single..
24 x Handle-Jar Ozi Jars! 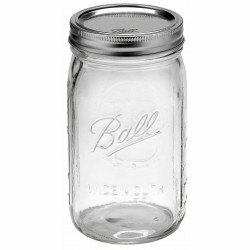 Beer Moonshine Glass Pint Jar Regular Mouth with Ball Mason Silver Daisy Lid. C'mon Ozi C'mom! 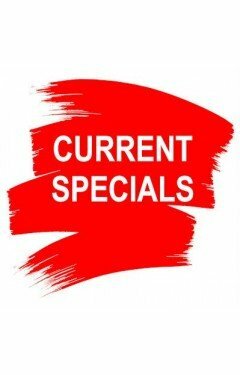 Get a quality Ozi Pint Jar! Embossed with an image of Australia and the words "Ozi Jar" these are sure to be a huge hit! And complete with a silver daisy lid! A unique gift for the overseas visitor or to show off to your mates! In the pubs in clubs around Australia you will soon be no longer asking for a pint, but for an "Ozi" Put a plastic lid on them and they make a great glass for a kids’ party or even fill them with lemonade or punch for a fun idea for a picnic, barbeque or wedding!Embossed with an image of Australia and the words "Ozi Jar".&..
Gold or silver one piece lids may be purchased as optional extras.These mugs are used as moonshine glasses and as beer glasses in bars and restaurants all over the USA and are making rapid inroads in Australia.Outside of their use as a drinking mug, they can also be used for arts and craft and gift giving. They suit all Ball Mason regular mouth lids so use them with a drinking straw lid or put on a daisy lid for a really attractive jar for candles or pot pourri.415ml max capacity measures W 70mm x H 125mm (10cm wide with handle). Ideal for serving beer, cider, or ..